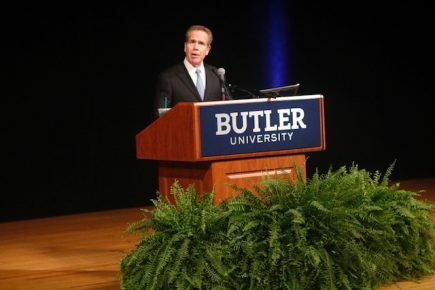 Butler Newsroom | In State of the University, Danko Asks: How Can We Be Better? Butler Newsroom > Butler Home Page > Home Feature News > In State of the University, Danko Asks: How Can We Be Better? Overall, Danko said, Butler has made great strides, from the classroom (new programs that include the first student-run insurance company in the nation and a collaboration to record and produce musicians participating in the Indy Jazz Festival) to the city (the University contributed more than 77,000 volunteer hours to the Indianapolis community) to Admissions (applications are currently up over 8 percent compared with this time last year) to Athletics (Men’s Soccer and Tennis winning BIG EAST championships and David Goldsmith being named the BIG EAST Male Scholar-Athlete of the Year). -Irvington House, the 647-bed residence hall being built on the site of former Schwitzer Hall, which opens in fall 2018. -The Lacy School of Business building currently under construction and slated to open in fall 2019. -Major upcoming renovation of the science facilities for the first time in more than 40 years. At its most recent meeting, the Butler Board of Trustees approved plans for the construction of a new addition that will connect Gallahue Hall and the Holcomb Building, as well as the renovation of the existing buildings. -Upcoming finalization of a campus-sharing agreement with Christian Theological Seminary (CTS). In 2018, the College of Education is expected to move to CTS, a spacious location that will better suit its learning objectives. Danko praised the Board of Trustees for holding the 2018–2019 tuition increase to 3.25 percent, the lowest increase in at least the past 11 years, while boosting the financial aid allocation to $68 million.